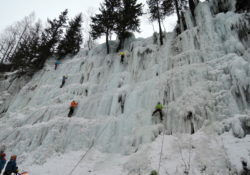 An ice climbing paradise some will say, but only if the conditions are right. And how is one suppose to know and plan months in advance? If only I could move closer to the mountains. That would certainly make it easier, no more holiday requests, no more flights and most important no more prayers for good weather. For the past two winters I have been favouring mixed climbs to the Alps over the pure ice trip but it was about time to get it done. It just happened that this year the continent received too much snow. So much that the avalanche risk hasn’t dropped under 4. In the end it was a successful trip even though we haven’t really done much from our list. An extra reason to go back next season. We decided to stay in the village of Lillaz as it was much easier to access the waterfalls since we opted to use public transport rather than rent a car. In the end, getting there turned out to be a journey on its own. From London one can fly either to Turin or Milan airports. The hard part though is getting the flight, trains and busses timetables to match without spending all day on the road. The plane landed in the evening on Milan Malpensa from where the express shuttle took us to Milano Centrale . Accommodation is expensive and all hostels charge extra for late check in. 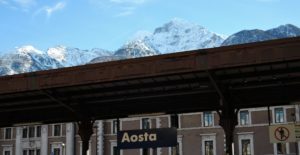 Without being to picky we took the cheapest double room within walking distance from the train station – Guest House Pirelli. Rooms are basic and the noise and bad mattress woke me up multiple times. The only advantage is the 10 minute walk to Central Station and a non-stop Carrefour. The next day by 7am we were already in the train to Chivasso where we did our first change, but not after a 20 minutes delay that almost made us miss our next connection. 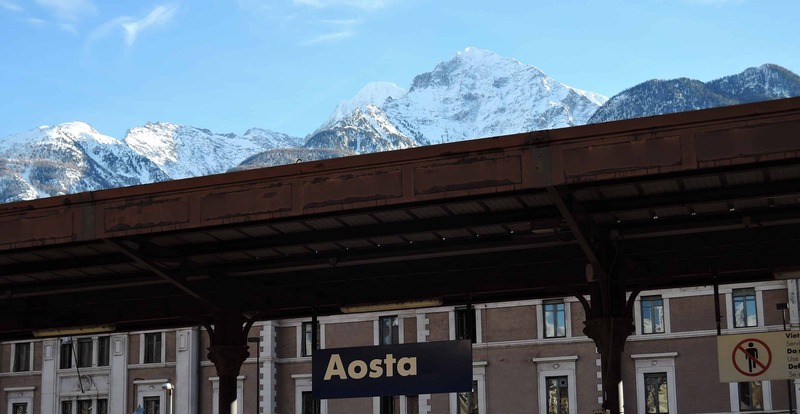 Luckily the train waited and after a final change in Ivrea we jumped off in Aosta just in time for the bus to Cogne. The local route is operated by Savda and tickets can be purchased directly from the driver. All the busses stop and leave from the main station, just across from the train stop. We did the mistake of getting off at the cemetery and missed our connection to Lillaz. Got picked up by the owner of the hotel and after half a day of travelling all I wanted to do is take a nap. There are a few choices but the one that seems to have the best reviews was Residence Les Nigritelles. And also the best rates – 300euro/5 nights. 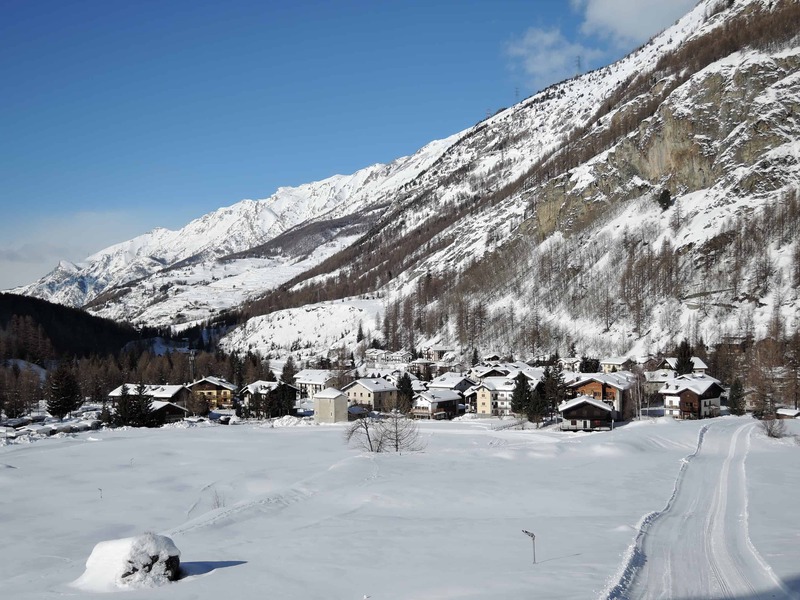 A studio with two beds, fully equipped kitchen and own bathroom for a third of what you pay in Chamonix. The place is clean and well maintained, modern and minutes away from the famous Lillaz waterfall. Owners are very nice and at the end offered to drive us to Cogne. The village is small, with a few restaurants and a small supermarket that was never open. There is a bus every hour that connects it to other settlements. The cafe bar next to it sells fresh bread, but we did all our shopping in Cogne. By the time we finished unpacking and had lunch it was almost 3pm. The excitement and joy took over and quickly forgot about how tired we were. Would have been a shame to waste the few hours of daylight left. As the famous Cascade de Lillaz was just minutes away it seemed the obvious choice. As it’s over an year since I climbed any ice routes apart from the indoor training wall at Verticall Chill a training session is most welcome. 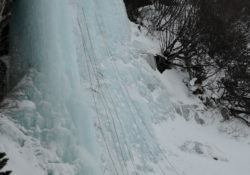 After practising screw placement and V threads we climbed a few times the first pitch of the cascade. Good ice overall but could have been colder. At the top a big opening lets the water run through. 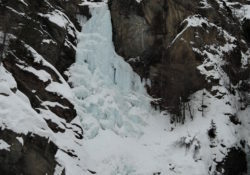 The area has a second smaller waterfall and a few dry tooling routes. Tired from the road we decided to call it a day and head out for dinner. Hotel Odenzana has a small menu but tasty food and reasonably priced. Home made desserts and good wines. There aren’t many guidebooks of the area, and the only one I had was a french edition from ’99 – Cascades Autour Du Mont Blanc – vol 2. I assumed some of the routes don’t exist anymore but it’s better than nothing. We picked up a printed map of the area from front desk. Names, grades and location of over 100+ routes. Guide tells you how to get there and the map which ones are still climbable. We started the day with big plans and high hopes of finding some waterfalls just as in the photos we’ve seen. From the centre of Lillaz cross the bridge over the river, keep straight until you go by a church and reach a cross road. No matter which way you take, eventually they join again. As we found out on return, left is more straight forward and on the touring tracks. 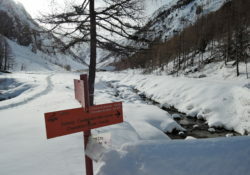 The right breaks the trail through deep snow, crosses another bridge to reach the riverbank and continues on cross country ski tracks. After 20 minutes it joins the left path at another bridge. Here are signed a few waterfalls and times. We continue on the same rive side to Fenilliaz – 50 minutes. The plan was to start with this 200m grade II and finish with two more grade III’s in the area. Soon after leaving the junction the snow became deeper and wind started to pick up. 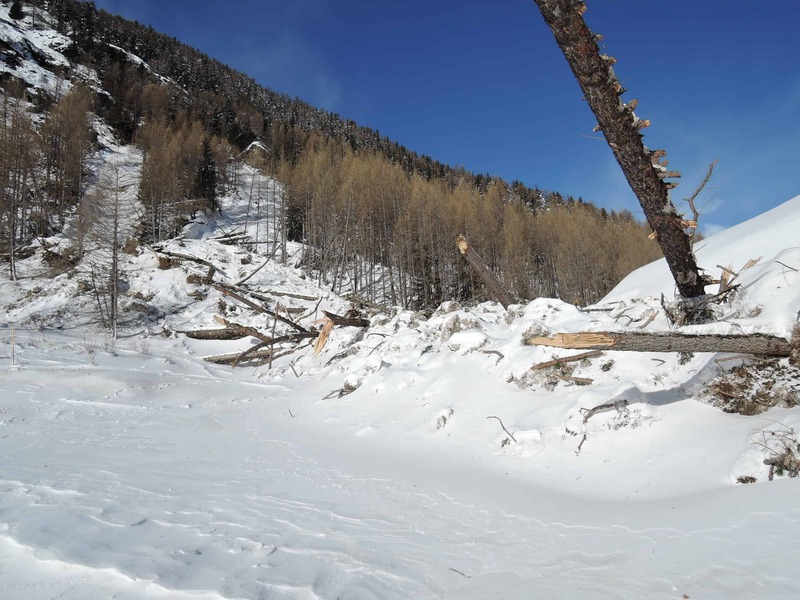 The remains of fresh avalanches started to raise a question mark. The level 4 risk seems more serious when you are in a narrow valley surrounded by mountain faces. Every gully had one and even the steep faces looked loaded. 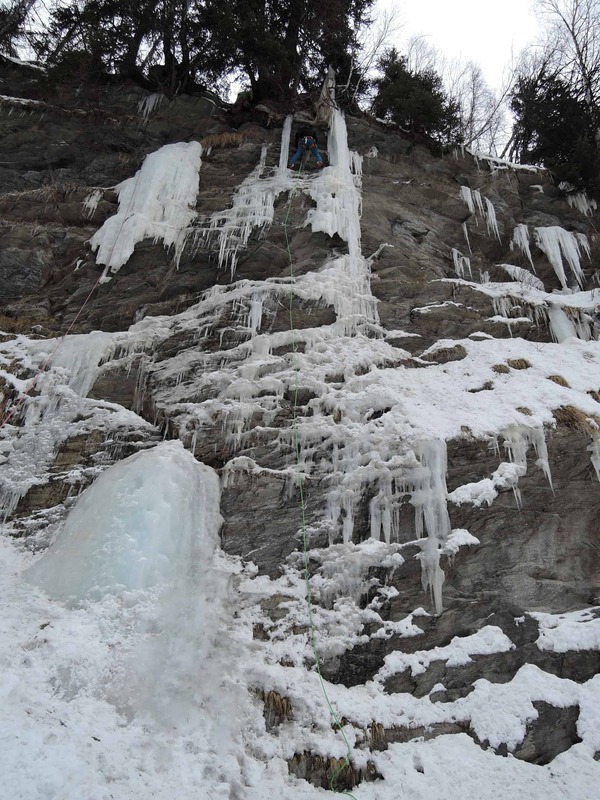 Nevertheless some more harder climbs like Patinaggio Artistico and Hard Ice in the Rock looked out of this world. The progress is slow and the constant crossing over debris and fallen trees doesn’t help at all. Everything seems buried under snow and we can’t see any of the falls from our map. At least we reach the destination. The start is covered in meters of snow from an avalanche. We start climbing towards the second pitch but the closer we get the more frighten I get. Is it really worth the risk? Any vibration could trigger another one at any time. Time to turn around and accept the defeat and the disappointment of my climbing partner which would have liked to continue. We tracked back and decide to finish the Cascade de Lillaz – Grade III+/ 5 pitches. If you come from the town centre, cross the bridge and take the first street to the left to reach the parking lot. From here take the snowy path by the water fountain and keep on it for another 5-10 minutes to reach the waterfall. 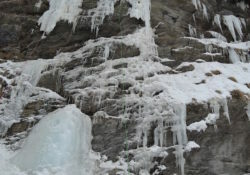 The climb is in condition most of the time and can be done even if when not fully formed, though expect a cold shower. The difficulty varies from grade II up to IV depending on the line you pick. There are bolts both on the left and right but we always like to take the hardest lines. First pitch is a 45m 60-70 degree with 85 for a short section to reach the bolt on the rock to the right. Second pitch is much shorter at 15m but considerably harder. Free standing pillar at 70-85 degrees depending on the approach. One can either traverse in the middle for an easier ascent or climb right above the belay point at a vertical angle. Top out with a few hooks in the rock and reach the bolt at the right. Depending on conditions, there might be an opening in the ice and care is required not to break through completely. From here there is a 5 minute walk to continue the climb either on the left at 85degree or right at a lower angle. 20m to top out the thirds pitch. Another 10 minutes take you to the last 110m of easier ground. Grade II ice with a higher angle towards the left. There is no need to use the rope if you feel strong enough. At the end, one turns right to the ridge where a panoramic view over the valley can be enjoyed. There is also possible to retreat after sections 2 and 3 by cutting throw the forest to gain the path on the right. Either abseil back to the bottom or down climb on the other side to join a narrow path that takes you to the village in about 20 mins. There should be a bolt int he rocks if needed. Fantastic first climb for both beginners and pros as a warm up. A top rope can be set for the first pitch. It’s possible to climb with a single 50m rope if you don’t plan to abseil. A pair of axes and 4-5 screws. For dinner we went out to Hotel L’Arolla. The only start serving food after 7.30pm and had to wait about an hour. The food is good, not necessarily better than the other place but fancier. I recommend the Baked polenta with cheese – loaded with carbs and fats for the next day of climbing. Add another beef stew and a wine carafe and you’re ready for bed. 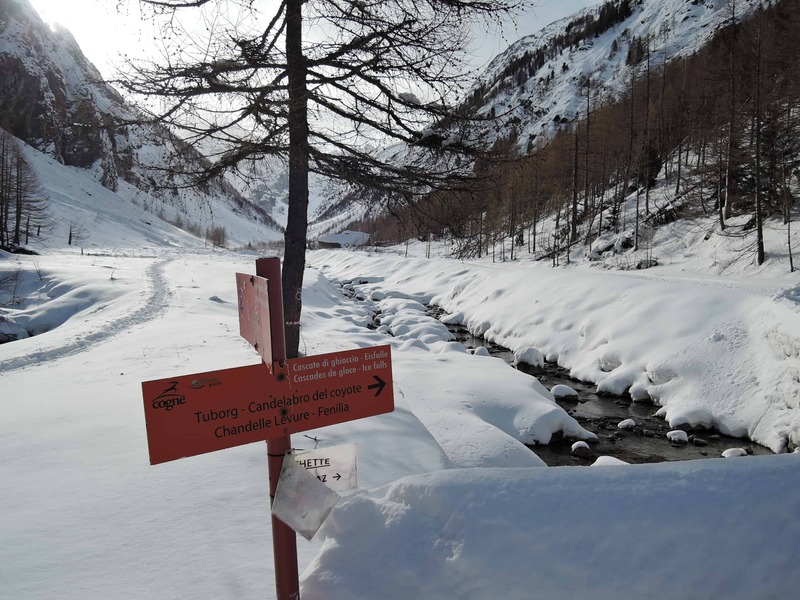 The weather forecast didn’t look promising at all and fresh snow fallen over the night raised the avalanche risk to 4. 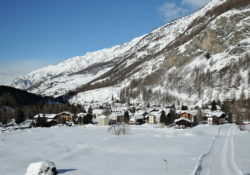 We decided to take the morning bus to Cogne and walk down to the riverbank just below village of Moline. The entrance is marked by a small parking lot from where a narrow path takes you down to the climbs. 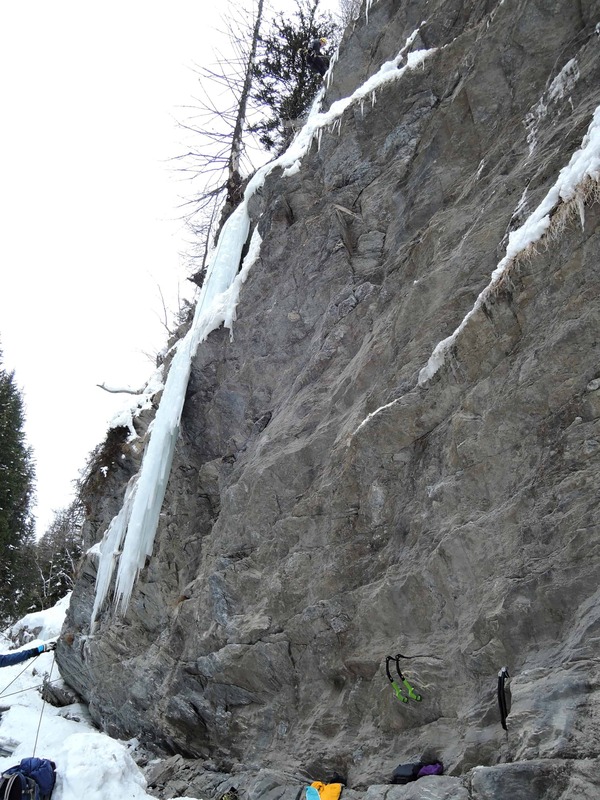 On the 20m wall, local guides have set a few mixed routes, a few M5/6 dry tooling lines and a water pipe to create an artificial ice wall. Everything is bolted and belay points set up. Weekend turned out to be extremely busy as most of the guide bring their clients there to learn the basics. The ice is a low grade 3 and when busy you’re lucky if you manage to set up a top rope. After climbing there for a while our attention was drown to the dry routes. We fooled around on a M6 but proved to be too much for a first timer. Just to the right, there’s a 10m WI3 that finishes with some frozen turf. In search for an easier challenge we found a M3 just before leaving the river bed. 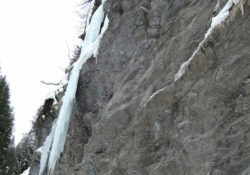 8 bolts in almost straight line, good rock hooks and a thin layer of ice for what was to be a short but enjoyable climb. We both agreed to cut the day short and head to Cogne for some supplies. Rey Market has a good selection of food and alcohol at reasonable prices, as well as a big selection of cheese and hams over the counter. We ended up buying over 7 different types of both. For bread and pastry you can find a better selection at La Maison du Gout. A bit pricey but very tasty. Sadly there wasn’t enough tine for us to eat and have a beer at the famous Licone Bar. Loaded with groceries and tired the bus seemed a better choice. It was about time to take advantage of that kitchen and save some cash. Again fresh snow over the night didn’t let us with too many options. Having been asked a local guide the day before for safer areas to climb Mur de Lau Bij was one of the recommended ones. From Lillaz follow the same direction as for Cascade de Lillaz. At the first junction, follow the signs and take the the right path that ascents into the forest. There is normally a trail but it’s possible that you might have to break the trail. Have Lillaz Gully as your reference point. After about 40-50 minutes we get a glimpse of Lau Bij, a superb WI5+ 60m climb. There’s a party already on the first pitch and another one waiting. The first 10m look hard to protect with just a super thin layer of ice covering the rock. A short traverse to the right at the base of a free standing 90degree 20m pillar and another short traverse to the bolt on the left. Second pitch is barely visible form the bottom and we have to take distance as ice keeps falling above us. Second party started climbing but they move very slow and after 30 minutes they still haven’t broken through the rock band. We leave in a search for another climb but soon face a swim through waist deep snow. 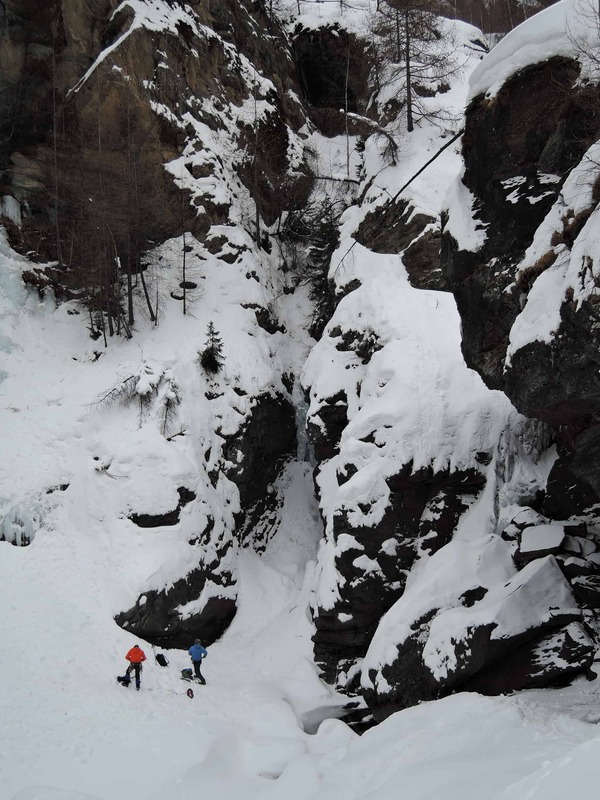 On the right a guide with it’s clients breaks the trail and we both think the same – follow and save energy. At last at the base of Loie. Good ice and plenty of routes. the easier ones have been taken by the guide and forced me to take the middle line which turned into a IW3+. 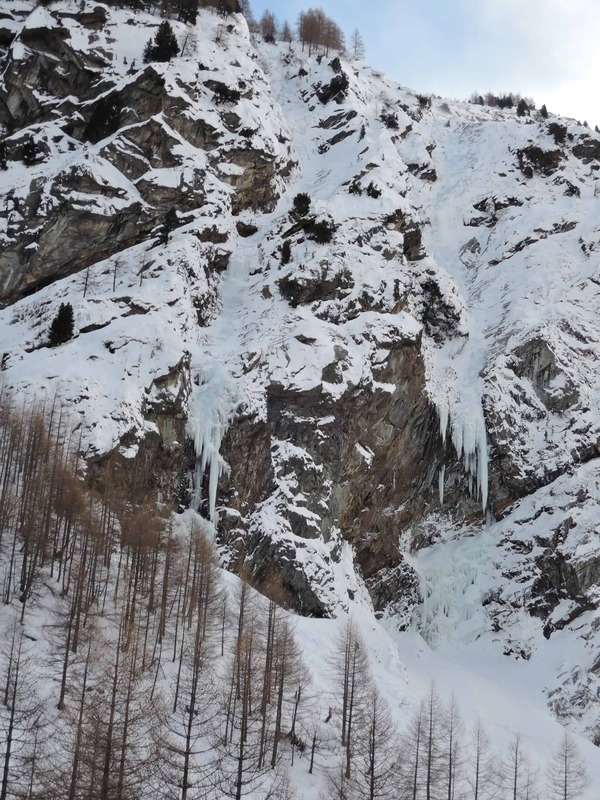 30m of ice that ends with a snow gully. Both belay points are either on the left or far right so if you finish in the gully you need a new anchor point so a double rope is required. Otherwise a single 60m is sufficient. To the left there is a much harder free standing pillar and far right a mix of ice and frozen turf. We climbed different routes alternating the lead as my climbing partner didn’t feel up for the challenge of a 5+. Enjoyed a frozen dried lunch and some home made french alcohol form one of the climbers and back to the valley as the dark was falling fast. We are getting close to our last full day in the valley but the weather hasn’t change. Even worse, it’s above 0C and raining. 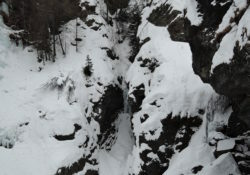 The Lillaz Gully is out of conditions and so are the dozen of easier climbs in the valley. The only option is to head back to Cascade de Lillaz area and make the best of it. 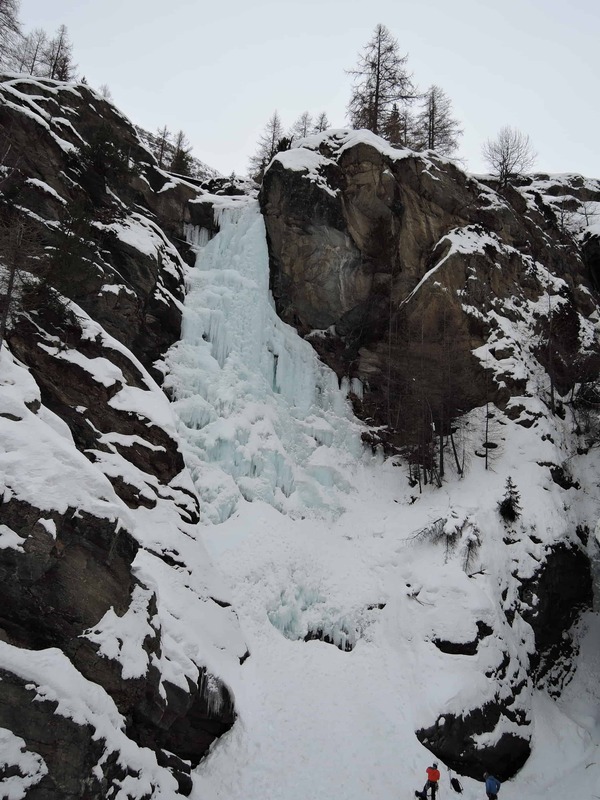 I started off with the short Chandelle de Lillaz, a 10m WI4 pillar just right of the main waterfall. 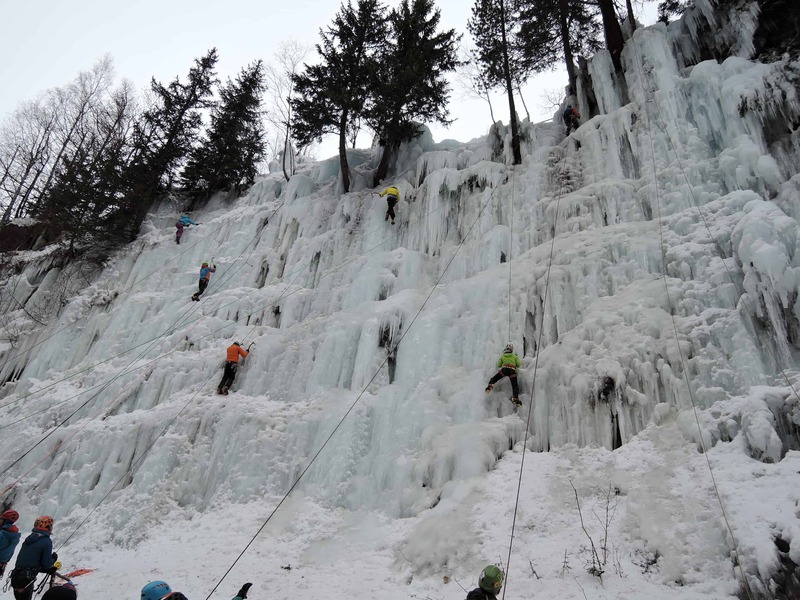 There’s a belay point in the trees on the left and not too many options for screw placement as the ice is thin. 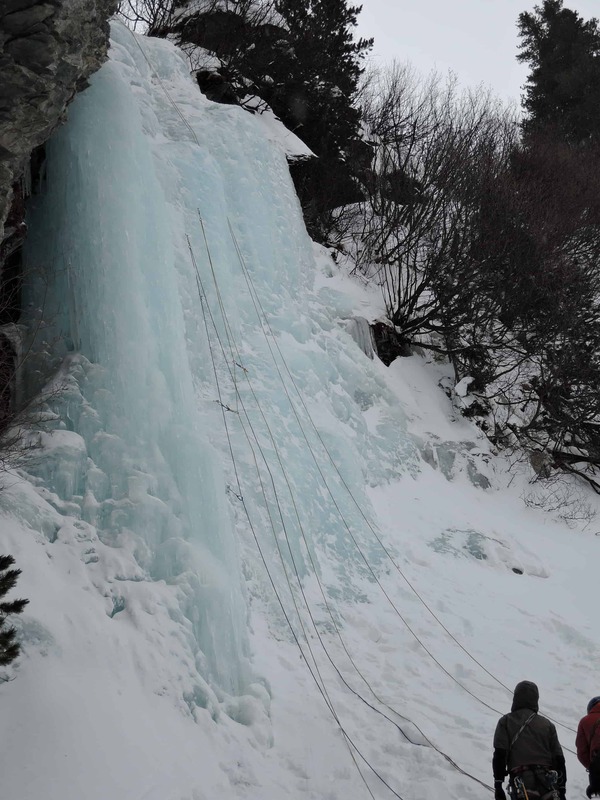 We moved to the main climb but stopped after first pitch as the ice was already rotten. Placed 2 screws all together which I doubt would have hold a fall. Broke through the ice into freezing water and ended up soaking wet. Decided not to continue as another party was backing out from the second pitch. After a mid day break for lunch and rest we returned to the mixed climbing area later in the evening. Just right of the river, where the rock starts there is a 6m crack with a belay bolt at the top. Makes a fun warm up for the harder M3-M5 climbs to the right. Ended up spending 3-4 hour on the rock face. Ruined 2 draws and set up a GoPro for time laps that didn’t capture anything. Last day of our trip was warm and sunny. Too warm for safe climbing. Even so I wasn’t finished just yet. The bitter aftertaste of a heavy winter had to be washed somehow. Headed back to the only waterfall still climbable – the Cascade. A few parties tying to get the best of it but everything was melting and the mid section gone. As my climbing partner decided to turn back, I soloed the last 3 pitches and topped on the final ridge for a last view over the valley. Returned to the hotel, I packed and started our journey back to London the same way we came. No trip to Italy has to end without a pizza. Our lunch in Aosta at Bella Napoli was under expectations. And the prices, too high for how the place looked. The journey continued but not without a flight delay that almost made me lose the last train from the airport. 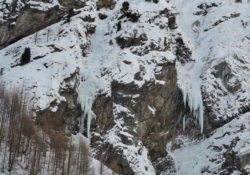 Cogne and the surrounding valleys are a climbing paradise, sadly we can’t control the weather and this year the snow and avalanches ruined our plans and hopes. We returned safe and even though we repeated some of the climbs is still better than indoors and that’s all that matters. I also learned something valuable – is quite important you and your climbing partner see risk and safety with the same eyes. And also that communication is a powerful tool that if not used properly can create tension and dangerous situations. I will certainly return to the valley one day, but for now I still like Chamonix better. Sadly one of our camera became faulty and lost most of the photos from the climbs.